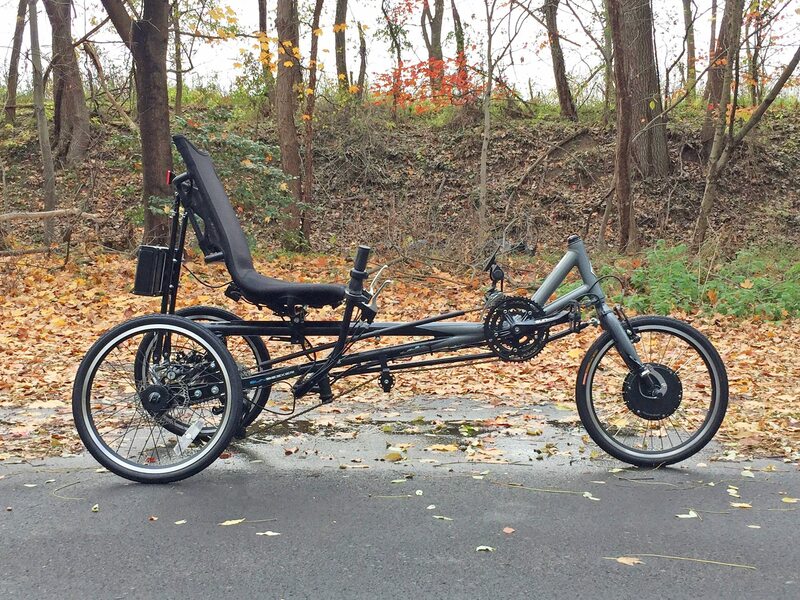 The Sun Seeker Eurus Electric Trike is a professional conversion job by Electric Bike Technologies. These guys own ElectricTrike.com and E-BikeKit… they built the Liberty Trike and have a warehouse in Croydon Pennsylvania that I got to visit for several days. When we came to the Eurus model I was very impressed and felt like I found the sweet spot between performance and value. 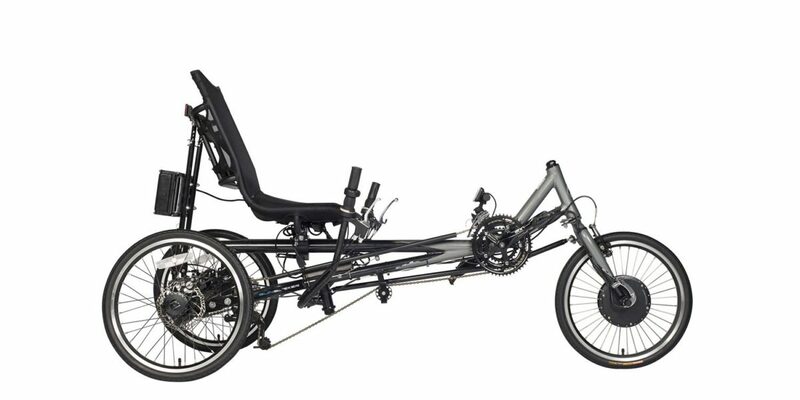 This trike has two disc brakes in the rear along with a linear pull v-brake up front so it’s easier to stop than the Eco Delta model (one step down). 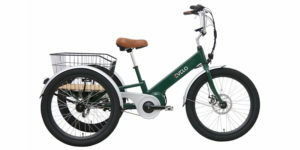 That’s a good thing too because neither of these trikes is especially light weight but the Eurus here can reach ~26 mph with its 500 watt geared hub motor and 48 volt battery (compared with a 36 volt on the Eco Delta). The frame is a single piece of Aluminum alloy vs. steel with sliding boom but the seat is still highly adjustable. You can slide it forward and back as well as tilting the back rest. 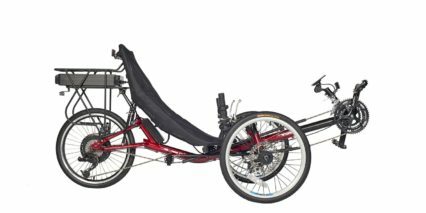 One major down side to either of these Delta style recumbent e-trikes is that they are rear heavy and don’t have a cargo rack like the Tadpole trikes. Tadpole means two wheels up front and Delta means two wheels in the back by the way… So I really like how easy the Delta models are to mount and actually appreciate the higher seat (because my knees hurt if I squat too low) but they aren’t as stable and you just don’t have as much space for gear. One minor help are the two sets of threaded eyelets on the seat railing. 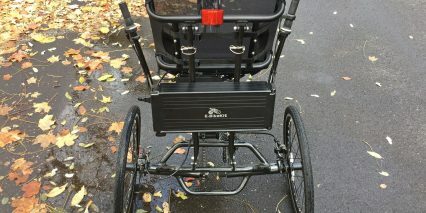 They are positioned separately from the battery pack which is mounted on the seat support arms. The battery pack on this electric tricycle hits the mark in some ways and gives me pause in others. 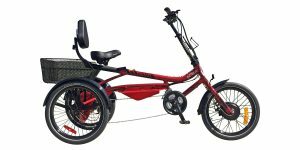 Compared to many of the other trike models, this pack is very easy to get to. 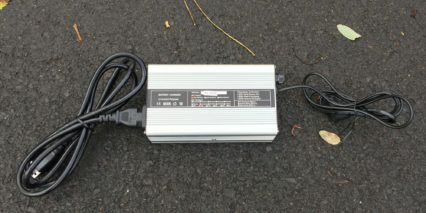 It’s not buried in a rack or basket and can easily be charged on frame. 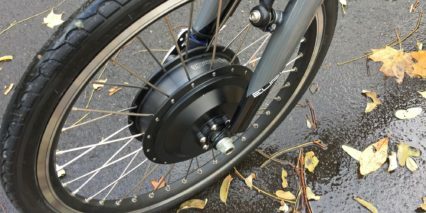 Just like the others however, you need to leave the key inserted in order to power on the ebike systems and if you’ve got the key attached to a chain it can bounce around. Still, because the pack is mounted completely behind the seat, the key isn’t really in the way. 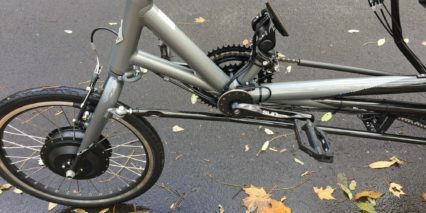 My concerns about the battery evolve around how it’s mounted to the bike frame. Instead of mounting directly to the thick frame tubing or a reinforced rack separate from the rider, it’s resting on the seat supports which are already doing work to hold the seat up (potentially a lot of work if the seat is at an extreme angle). In my time testing the trike this didn’t seem like an issue and I think the pack is probably fine at an angle… the battery box is mostly Aluminum and it has plastic end caps with a handle that felt solid. I guess it’s just something I haven’t seen before and more of a compromised solution than an ideal. 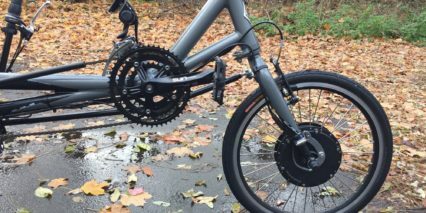 That’s one of the trade-offs with any conversion ebike vs. a purpose built one, you end up with some compromises but it tends to lower the price point and bring unique features like higher top speed and open source battery options. You can actually map the battery curve using the display system on this bike for use with different sized packs from alternative manufacturers. 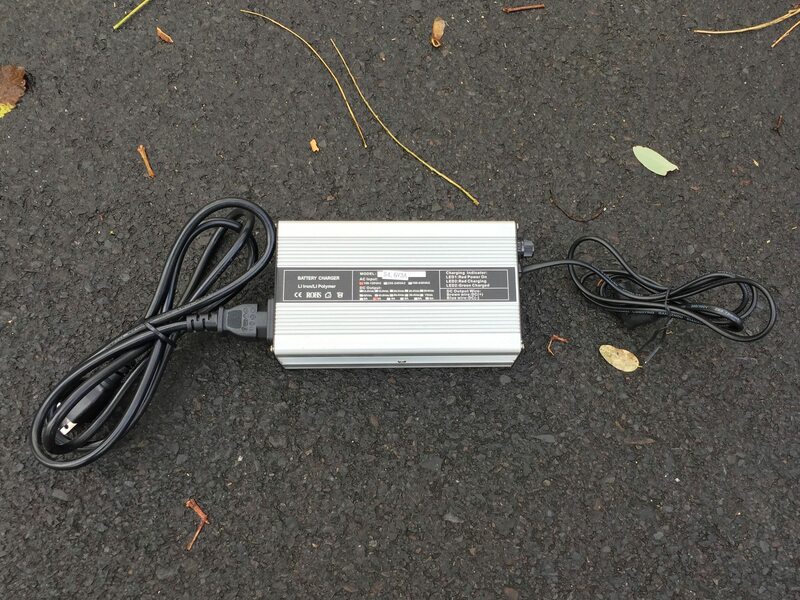 The battery powers a 500 Watt nominally rated geared hub motor that can peak around 1,000 watts. It’s very zippy but some of that torque is lost if the wheel spins out. Remember, this trike is rear heavy with both you and the battery way back above the wheels. 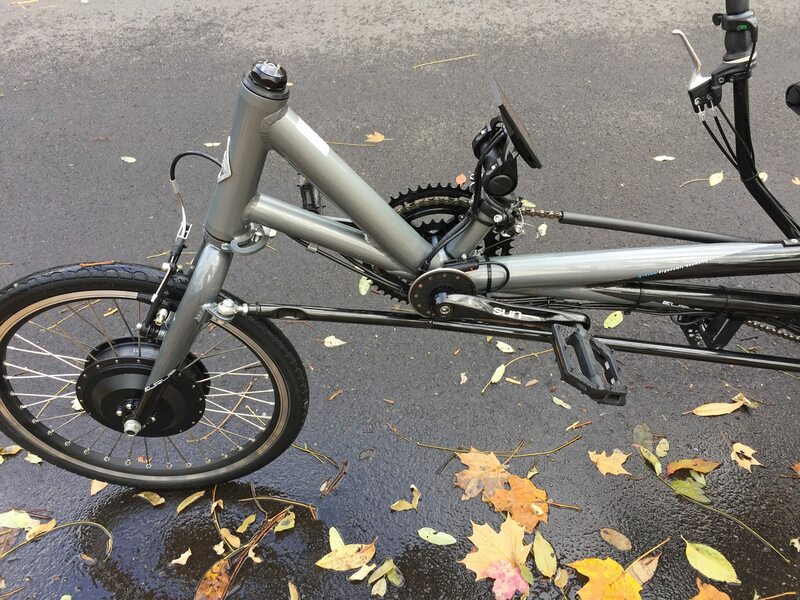 I saw this only once during my test ride and it happened while riding over a pile of wet leaves. 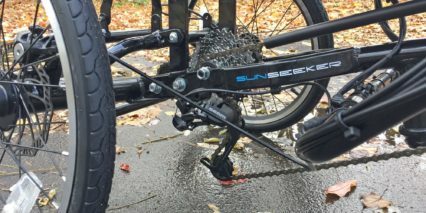 The motor is securely fastened to the front fork and built into a 20″ wheel with larger 12 gauge spokes and reinforcement eyelets. 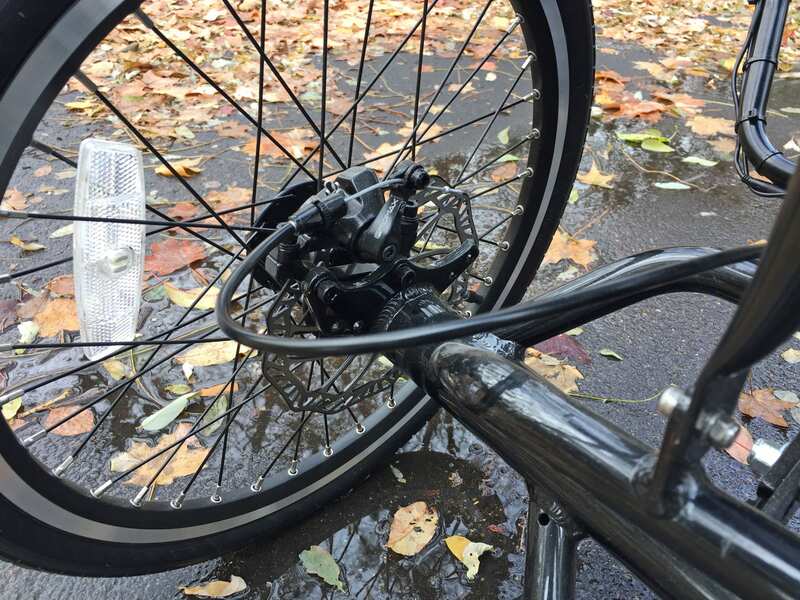 Actually, all of the wheels have nicer spokes and rims which reduces the potential for cracking and breaking situations. 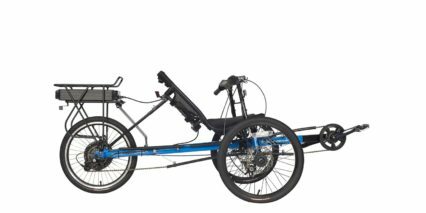 The max capacity that the trike can handle is 300 pounds according to the Sun Seeker website and given the roughly 10 lb motor and 10 lb battery you’re down to maybe 275 lbs with all of the electronics and mounts accounted for. 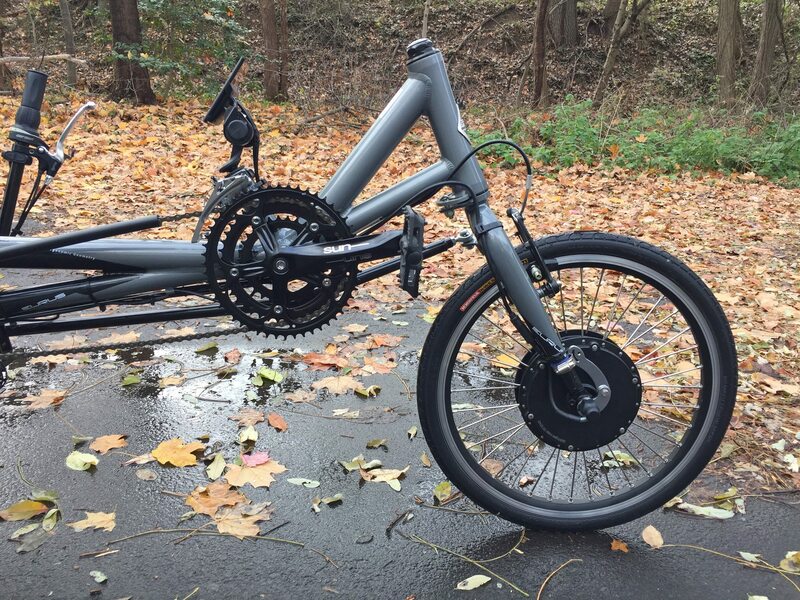 The ebike wires are run along the main tube of the trike and blend well with the black and gray color scheme. I love that they used an oversized torque arm when mounting the motor because it really is powerful and this will keep the frame and dropouts from bending. 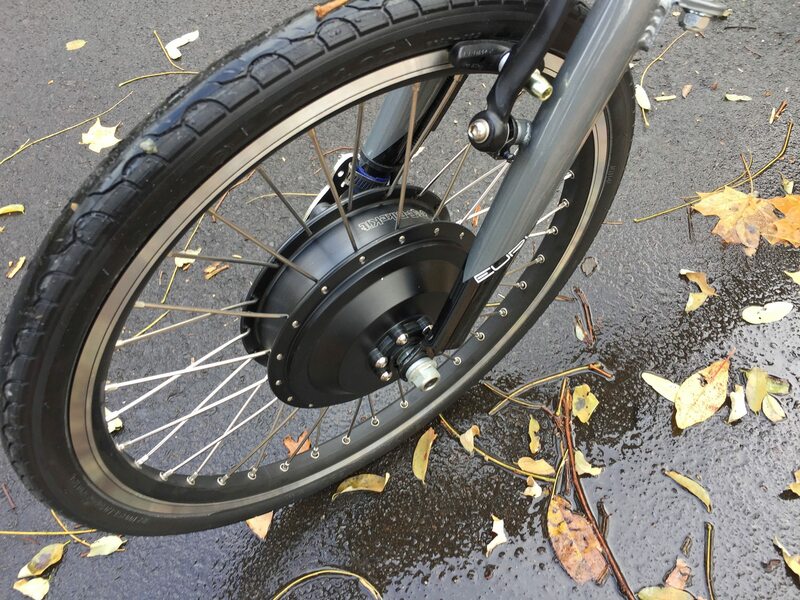 Geared motors freewheel efficiently but produce a bit more noise than gearless. The weight of this motor tended to tip the front wheel to one side or another while I parked. It adds a bit of momentum while riding and requires a touch more arm strength for steering. Operating the trike is straight forward with the key in the battery turned to on, holding the “M” button on the control pad (mounted below the left grip) then pulling the trigger throttle. 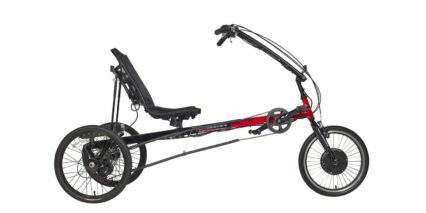 I believe the trike can be setup with throttle and cadence sensor as the demo bike I tried had. It’s nice to pedal along and have an incentive to workout and stretch. The bike is comfortable and the cadence sensor is responsive, having 12 magnets, but the throttle option is more satisfying. 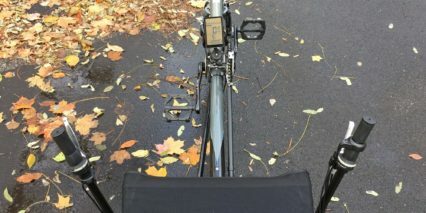 I tended to start from zero using it and then pedal along, leaving the bike in a higher gear most of the time because shifting takes time and effort. 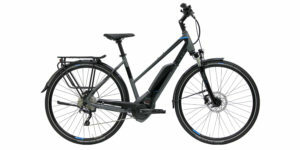 The Eurus has 24 speeds which is really a lot for an electric bike. 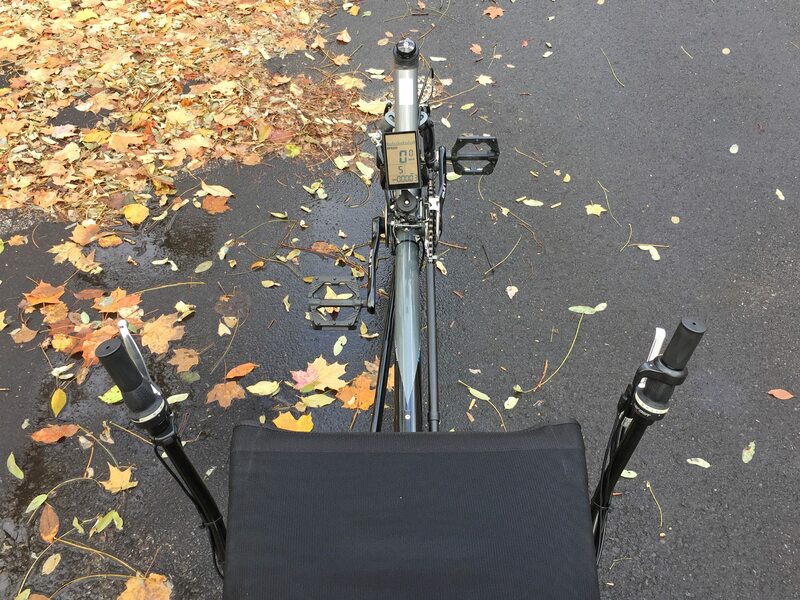 Since you can hit ~26 mph assisted with the electric motor system, those extra gears come in handy and I love that they upgraded to SRAM shifter hardware vs. the generic Sun Seeker brand found on the lower level trikes. Back to the display, it’s large and bright with a backlight option (just hold the up arrow for a few seconds). I like that it swivels but wish it was removable just in case you have to park outside in public or leave your trike outside at home. 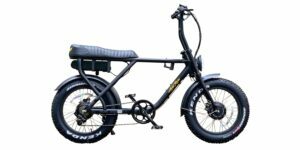 This is a larger ebike after all. The display gives you more than just battery, speed and power level. You can dig into the options for battery curve settings, top speed settings and even amp output which changes how zippy the throttle feels. The throttle itself is another area that I felt mixed on. They had mounted it between the grip and twist shifter which got in the way for me. It’s easy enough to move behind the grip twist but then you have to reach further to pull it. Note that the maximum power and top speed on this trike (in pedal assist or throttle mode) is governed by the power level you choose 1-5. My own preference is usually where you can adjust pedal assist but override with the throttle any time (since it is a variable speed throttle). Given the sportier feel of this trike, that might be a nice option to see in the future but for the time being, it’s not too bad clicking up once or twice on the left button pad to get that power. All things considered, this is a fun and capable electric trike. 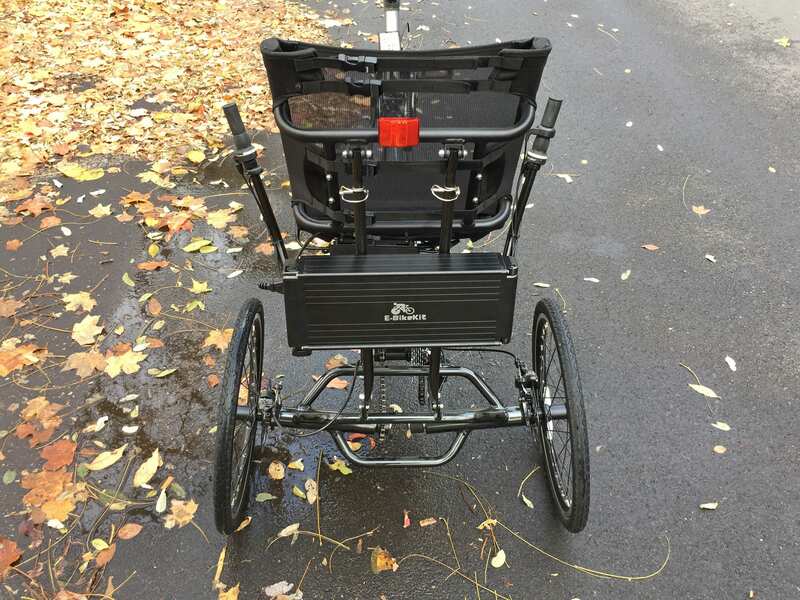 The seating position is comfortable but not as aggressive, you get the below-seat steering of a tadpole trike but don’t struggle as much to sit down and get back up after each ride. 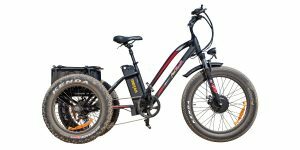 I’m not sure I really need all of the gears they offer but it would come in real handy for steep terrain or if the battery ran out… and I would like to bring the charger along to extend my rides but am not clear on where to store it. Maybe a front facing backpack or a custom seat bag? The thing is, the battery is already adding weight to those seat support arms and that makes me hesitate about adding even more. I like how all of the wires blend in and think the black and gray color scheme is professional but wish the trike had lights or a flag pole, even tires with reflective sidewall paint would make a huge difference. Definitely get some of your own lights going, maybe a helmet light to raise them up and be see. 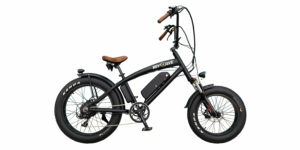 The Eurus is an exciting machine for the price and even with the $300 shipping fee, you’re getting a product from an ebike company that has been around for years and backs it up with a one year warranty. Big thanks to Electric Bike Technologies for partnering with me for this review. 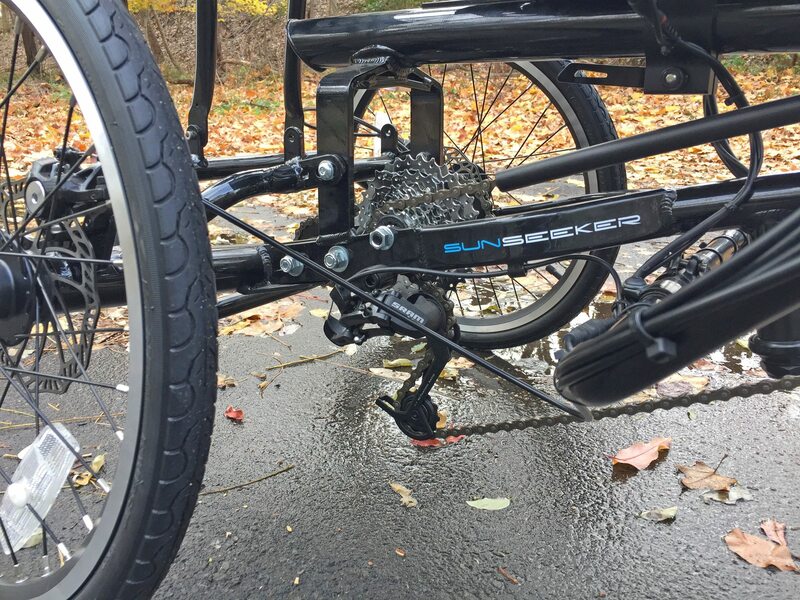 One of the nice features of a lot of delta style trikes is that you can get a coupler that allows you to daisy-chain two or more trikes in a row for an easy to convert tandem. 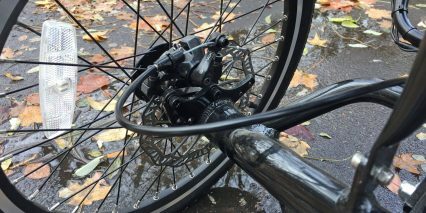 The front wheel comes off the rear bike and the front fork attaches to the rear of the lead bike. I know that Utah Trikes offers a coupler designed for this Eurus trike. 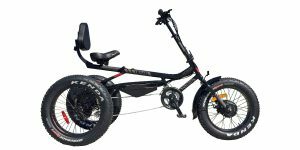 Of course, the second trike would not have a front wheel so it would not be powered like the lead bike. You can still quickly disconnect and have two separate trikes anytime you want to ride alone. Most of the couplers allow any trike to be “towed” behind, so the rear trike can be a different brand also. 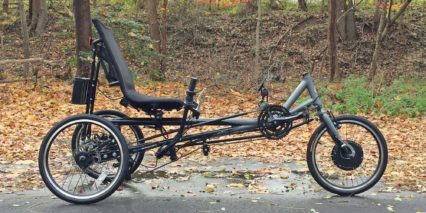 Here is an article showing another brand of delta recumbent with two trikes hooked up to make a tandem. 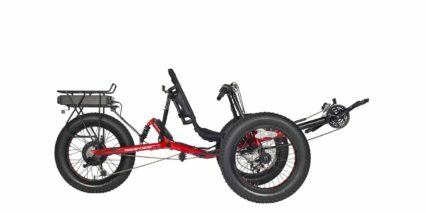 Upon further reflection, I am not sure if the coupler Utah Trikes offers is something you can just bolt on. They do a lot of custom frame work at their shop, so it might be something you have to have done on site in Utah. Someone at their shop could confirm what is involved. But it does open up all kinds of fun possibilities. And again, the second trike does not have to be the same make or model. If a couple was going to mostly be riding together, you could just buy a second trike without a motor and put that on the rear. For instance, you could buy a non-electric Sun-Seeker Eco Delta and tow it behind this Eurus model with its high voltage battery. 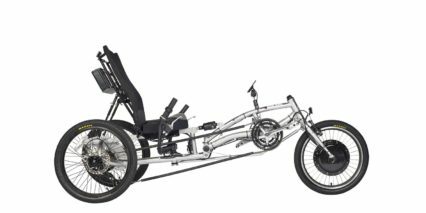 This arrangement also allows both riders to pedal at their own cadence and level of effort as the drive trains of the two trikes are not connected. And you do not have to settle for just two trikes in a row. Three or more is easily doable.